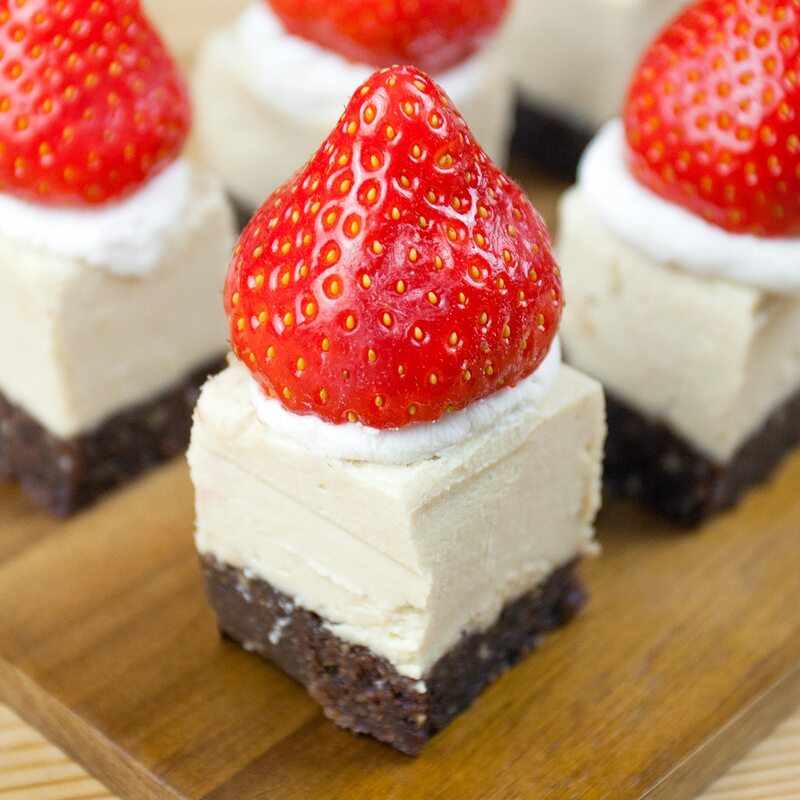 How good do these raw santa hat cheesecakes look? We’re really pleased with this recipe. It’s sweet, creamy, nutty and they just totally look the part. If you can’t find coconut cream, simply buy a tin of coconut milk and leave it in the fridge to set. But make sure you buy a good quality tin of coconut milk with a high fat content, otherwise the water might not separate from the cream when it refrigerates. When you open the tins, you should be left with the sweet, creamy coconut at the top. Soak the cashews in hot water for 1 hour. Place the base ingredients into a blender and blend until the mixture is a soft consistency and no large pieces remain. You may have to stop the blender and scrape the ingredients from the sides, then blend again until you reach the desired consistency. Set the base mix aside and rinse out the blender. Place cheesecake ingredients into the blender and blend until smooth. Grease a loaf tin with coconut or olive oil, then line all four sides with parchment paper. Pour the base mixture into the loaf tin and level the mixture using the back of a spoon. Then pour the cheesecake mixture over the base and tap the tin for an even top layer. Place the loaf tin in the freezer for 2 hours. Remove the loaf tin from freezer, turn out the cheesecake and cut it into roughly 18 even squares (depending on the size and shape of your loaf tin). Whip the coconut cream until light and fluffy, and pipe or spoon a little onto each cheesecake. 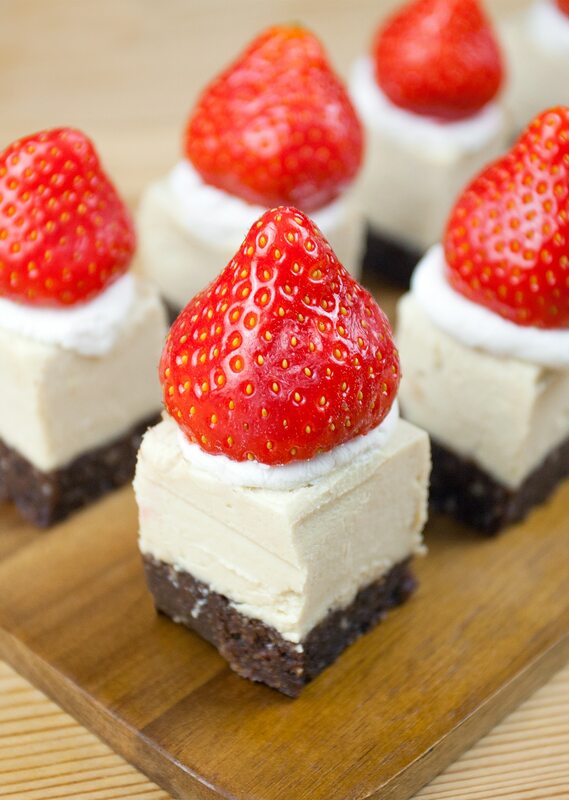 Then top each cheesecake with a strawberry. Hi! Wondering where you buy your cocoa butter. I have called/visited numerous grocery stores and none of them seem to have it…would love to try this recipe! Which brand do you use. Maybe we can track it down. I am unable to locate edible cocoa butter. What would be a suitable vegan alternative? Thx! I just made them and used half vegan margarine half coconut oil ( Hard) instead and they are lush! Did you keep it in the fridge or in the freezer between the time it was made and the time you ate it ? Can you store it in the fridge? Will it melt at room temperature? How long can you keep it at room temperature? I’d like to know what kind of blender you’re using please? I don’t use vegan maragarine… can I use only coconut oil instead? What can I use instead of golden syrup? It’s. It my favourite ingredient. Would it work with honey or maple syrup or agave nectar? What can I use instead of golden syrup? It’s NOT my favourite ingredient. Would it work with honey or maple syrup or agave nectar?